Dublin - Ireland will improve on their Six Nations title form and mount a major World Cup bid, according to the next international coach aiming to outwit Joe Schmidt. 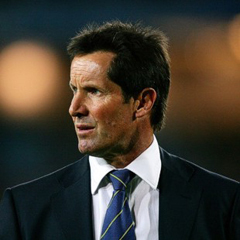 Former Australia boss Robbie Deans takes charge of the Barbarians at Thomond Park on May 28 - when Ireland return to action for the first time since lifting the Six Nations trophy at Murrayfield. Deans has watched Ireland’s development at close quarters. His Australia side were beaten by them in the pool stages of the 2011 World Cup after registering wins at the Aviva Stadium in 2008 and 2010. And he expects Schmidt’s team to develop the all-round game that saw them finish the Six Nations by putting Scotland to the sword 40-10 to successfully defend their title. "Ireland have got a real depth of belief there now and they’ve had some consistency in recent times,” said Deans. “They’ve got an experienced group but also a very vibrant group, so they’ll be looking with a lot of confidence towards the World Cup. "Essentially they’ve worked very hard - you can see it in their conditioning - they’ve got a real clarity in the way they want to play the game and it shows. It makes it easy for the playing group to bring what they’ve got to the table. Deans also urged Paul O’Connell - Player of the Tournament in the Six Nations at the age of 35 - to think twice about hanging up his boots after the World Cup. "Paul's stature in the world game is massive and he’s got a huge amount of respect around the globe,” said Deans. "I noticed the other day that he said he wouldn’t necessarily close the door on the likelihood of further rugby and that’s a good thing because he probably gets better year to year! He’s certainly an immense part of the Ireland game. He will leave a big void for someone to fill." Deans will lead a multinational Barbarians side against Ireland and England in May - and he insists they will uphold the traditions of the famous invitation side which came into being 125 years ago. "To me the Barbarians concept is everything that’s good about the game,” said Deans. "It’s about the team aspect, the camaraderie of the game, looking to play positively and constructively, being prepared to take some risks and also wanting to win.